In her talk, Angi will explore the expansion in meaning and use of the term feedback and the possible impacts this may have had on our efforts to support others’ learning. Angi will suggest who can and does (and who cannot and does not) provide feedback and what it is that others do and could do. She will propose other frameworks, ideas, terms, that may be more pedagogically helpful to those who are not in a position to provide feedback (in its original sense). Hobson, A.J. & Malderez, A. (2013) Judgementoring and other threats to realizing the potential of school-based mentoring in teacher education, International Journal of Mentoring and Coaching in Education, 2(2), 89-108. Wedell, M. & A. Malderez (2013) Understanding Language Classroom Contexts: the starting point for change. London:Bloomsbury. Hobson, A. J., Ashby, P. Malderez, A, & Tomlinson, P.D. (2009) Mentoring beginning teachers: what we know and what we don’t. Teaching and Teacher Education: An International Journal of Research and Studies, 25(1), 207-216. 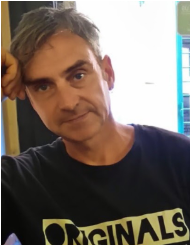 Russell Stannard‘s session will be entitled, ‘What can technology do for assessment and feedback?’ In this talk, Russell will highlight some of the key ways that technology can be used to facilitate assessment and feedback. Based on practical examples from teachers around the world, current research and his own ‘Assessment and Evaluation’ course, Russell will focus on what is realistic and feasible within most teaching contexts. It will include the use of E Portfolios, peer evaluation, reflection and using screen capture to provide feedback to students. This is a highly practical talk, full of real ideas and using simple, attainable technologies that are at the disposal of all teachers. If you want to hear Russell talking about enhancing feedback with technology or get a taster for what he might talk about, take a look at this page from his website. Russell will take you through a series of tools that can be used for assessment and feedback. Based on his own course, the afternoon will be spent building up an ePortfolio of different tools that can be used to assess and evaluate students. The focus will be on simple tools that are available to all teachers, and can provide the flexibility and ease of use that teachers need. Emphasis will be put on group-based, task-based type assessment activities that we can used in a flipped learning/blended learning environment. Russell will also take you through practical tips and tools that can be used to provide feedback on assessments, drawing on his many years of using ePorfolios and other digital assessments. Russell is the founder of TeacherTrainingVideos.Com. Previously a Principal Teaching Fellow at the University of Westminster and the University of Warwick, he is now a NILE associate trainer where he runs short courses on the flipped classroom as well as teaching on the master’s programme. 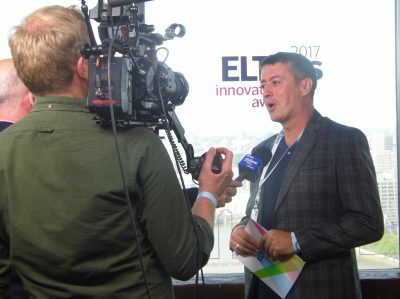 Russell was awarded the 2010 British Council ELTons Innovation award (the photo above shows him at the ELTons event in 2017) and the Times Higher ‘Outstanding Technology Initiative’ award. He is particularly known for his work and research into using technology to provide feedback to students. Russell writes a regular columns in the English Teaching Professional, the Express Publishing Teacher’s Corner and for the Move Languages Ahead blog. He has published widely on the topic of feedback and assessment. 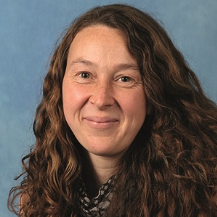 Helen Allen‘s session, ‘Making sense of digital feedback’, will look at kinds of data and frames of reference that teachers draw on when providing feedback for learners, and how this compares with feedback in real-world interactions. 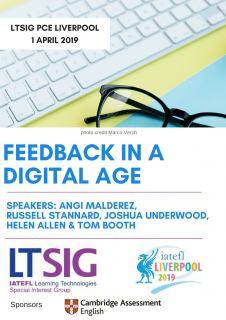 With this in mind, we will explore the relationship between teachers and technology in providing, supporting and improving feedback for learners. Helen is Digital Pedagogy Lead in the Digital & New Product Development team at Cambridge Assessment English. The D&NPD team iterates and explores digital solutions to solve real customer problems, partnering with developers to blend exciting, emerging technologies with expertise in assessment and training. Helen works alongside UX and product teams to guide both product development and investigation into language learning with new technologies. She works to create meaningful engagement in language learning and shapes digital products to fit the needs of language learners and their teachers. 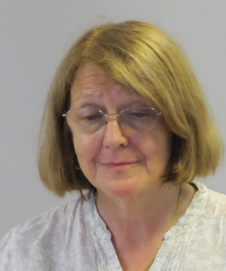 Helen has worked in ELT, with children and young adults in UK mainstream education and with children and teachers in bilingual education, in training and materials development for 20 years. Josh Underwood’s talk is entitled ‘Speaking with AIs, feedback, and being human.’ In this talk, Josh will highlight some ways we can use Artificial Intelligence (AI) technology to motivate speaking. He will look specifically at the role of feedback, the kinds of feedback AI and human teachers can provide, and the different values of these kinds of feedback. The talk will draw on Josh’s own teaching and demonstrate practical examples of using voice interaction with various forms of AI in classroom settings. The talk will also include examples of activities we can use with students that draw on their experiences with these technologies, to help develop digital literacy and more ‘critical’ engagement with the new AI technologies many of our students will grow up with. We will finish by looking at how engaging with AI can help us think more carefully about the value of human teachers and particularly the kinds of feedback we give to students. In the afternoon, Joshua Underwood, will lead a separate ‘demo’ session where participants will be able to work with Josh to try out and develop classroom speaking activities using Amazon Alexa or Google Assistant. Please note that the event is offsite at The Racquet Club Hotel, 5 Chapel Street, Liverpool, L3 9AG. This is a change from the original venue: Avenue HQ and an email was sent out on 19 November to all those had already registered. The day will run from 10.00am – 5pm. Badges must be collected from the ACC before you join us for the PCE. Update (1 December): We offered a CPD travel grant for this event, but applications have now closed. This post has been updated to include information about all the sessions and was previously used to promote Russell’s and then Angi’s sessions.